Uh oh! I'm starting to run out of ideas for this weekly challenge! I'm sure that I've got a ton of ideas, just need some more time to write them all down in my journal. My daughter came up with this weeks theme of BUBBLES. I'm constantly amused by her playing with her bubbles outside. 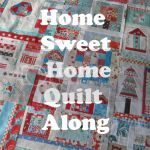 Here are some links if you want to quilt in bubbles!